I thought long and hard about what to give you all for Valentines day. There's so many of you,,, and you're SO hard to shop for. Hmmmmm. What would be the perfect gift to illustrate the love and admiration I have for you? I was stumped, so I asked Charlene, and in her infinite wisdom she said " How about some kittens? Who doesn't like kittens?". Of course, kittens. Now why didn't I think of that? So I got you some. I'm sorry, there are only two, so you're going to have to share. Their names are Vivienne and Theodore Spooner. Vivienne is the one on top. I hope you like them because I don't think I can return them. I'll tell you more about them on Monday. One more thing before you go...don't forget about the kitty card and tee shirt give away. To enter, all you have to do is start following Charlene (aka kittycommittee) on Twitter or become her friend on Facebook. You can also do both, and enter yourself twice! If you're already a follower or friend, consider yourself entered. For more details, read this post. You've got until the end of the day to enter. (11:59 PM Pacific Time) and the winner will be announced on Monday. Laurie, Craig, Charlene, Drewey, Vivienne and Theodore. best valentine present! how sweet! look at that ear floof!!! This is a great Valentine's Day present. "Who doesn't like kittens" indeed, and Charlene now won't have to find another hobby. Kittens! The Valentine's gift that keeps on giving. Healthier than chocolates, more long-lived than roses! Thank you! Miss Vivienne's facial expression is priceless, and I love Theodore's ear tufts! 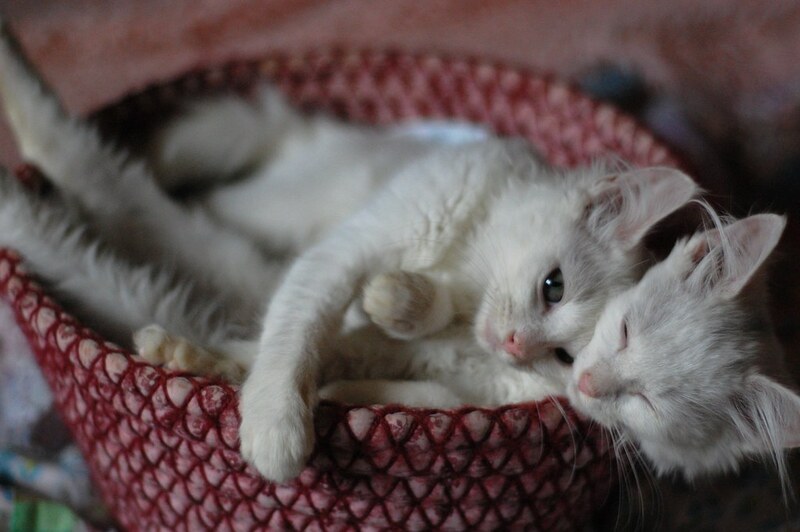 What could be better for Valentine's than two adorable, apparently lovey, kittens? You have excellent taste, Laurie! Wot better Valentine gift could we have! We LOVE these kittens already! Well, THAT's a teaser: "I don't think I can return them"....this is a PERFECT Valentine, and it has within it the promise of some more kitten-loving from our cherished Charlene Butterbean. I hope you both and Charlene and Drewey know how much love pours into your home. And I know I speak for a cast of thousands. If you receive back 1/100th of the joy and delight you deliver every day, you'll be aware of it. They look like they need feeding-up! Quick! OMG OMG! Soo cute! This is a great Valentine's Day! Happy Valentine's Day right back at you!!!! aw! The Spooners are SPOONING! Oh yay - best V Day gift ever! Oh, my. So dreamy. Love Theodore's scrawny little stretched out legs, and the way Vivienne's right arm is draped over the edge of the basket. That basket must have the absolute *best* kitty-love vibes of any item in the known universe. A very happy Valentine's Day to you, too, Laurie, and to all your IBKC cohorts. Thanks so much! I heart these teenies so much and I heart Laurie and Craig and Charlene and Drewey too! How do you pronounce Vivienne? Awwwww new babes!!! I too adore the ear floof, and Theodore's stretched-out leggies. They are gray and gorgeous, and have such sweet expressions on their little faces. <3s. ooo! they look like turkish angora. ahhhh.... they're so sweet you just want to eat them up, and what a perfect Valentine's Day present! I do not mind sharing, I think there is plenty of kitty love to go around. What a wonderful Valentine's gift!!! They are so beautiful!! Oh these babies are so much more delicious than any candy, more valuable than diamond earings, they are teh PURRFECT Valentines day present! What gorgeous babies! And I can already tell they are extremely photogenic! Wow - what a perfect Valentine! Vivienne has such a sweet look to her eyes, and Theodore is just so huggable with his stretchy legs! Can't wait to read more about them! If I am not mistaken, you have pictures of each IBKC litter in that basket! What provance! The happiest of Valentine days to you, Craig and the kitties!!!! I really need to know - how do you come up with these names? Is it just closing your eyes and opening the phone book? Will they be my Valentines? Hello little ones! I love you already! You look absolutely perfect. Aren't they just darling!!! Thank you! I love them! Anne - on the second syllable.